Ballz is a really weird fighting game where people either love it or hate it. 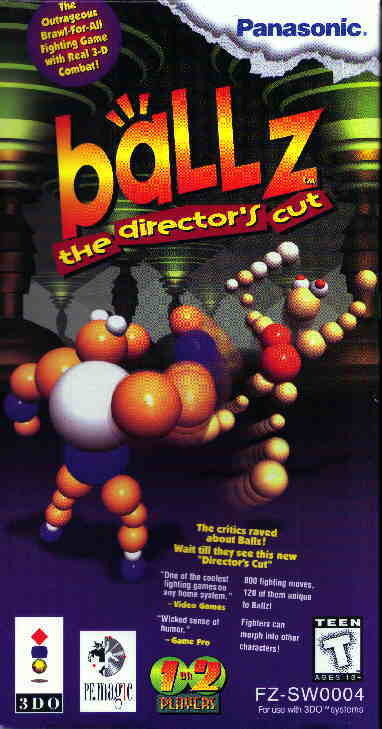 It originally came out in 2D format for SNES and Genesis, but Ballz made a conversion over to 3DO in 3D. There are actually pretty many good moves and moves to perform, as well as some finishing moves which are some of the easiest I've ever seen to pull off. Also there are kind of stunning moves which make your opponent innactive. I don't know which fighter it was but one of his moves was hilarious! He just keep rippin some farts! These are some good lookin Ballz! There really are pretty good backgrounds, but what is up with the fighting arenas. It sure is bland! That farting dude saved the sounds department. The sounds/music of this game aren't that great. All of the moves(well most) are very simplistic and easy to pull off. If you are good at Street Fighter, then this should be a breeze and even if you aren't then you still can learn them. Gameplay just isn't that fun. If you dont know/learn the moves you will be very board. You just keep going back and forth and whoever wins is the one who pushes the buttons the fastest. If you learn the moves gameplay is 8/10. A fun game. If you can't find WotW or SSFIIT then go with this game and you will probably like it if you learn the moves. Also I like to use plenty of different moves to spice things up. When I played my cousin in this game she just kept doing the same move and winning which is in easy win but is very boring to play and watch!